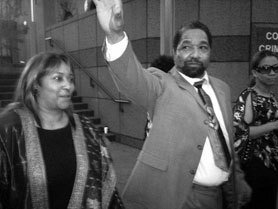 CHICAGO (FinalCall.com) - A jury was unable to come to an agreement in a controversial case in which Howard Morgan, a former Chicago police officer and senior patrolman for the Burlington Northern Railroad, was shot 28 times by Chicago police officers. After three days of deliberations, a mistrial was declared on May 12, and prosecutors are preparing to retry the case. According to the testimony of police officers directly involved in the case, allegedly Mr. Morgan became belligerent following a traffic stop close to midnight on February 21, 2005. The officers said that when they attempted to physically subdue him, a struggle ensued and Mr. Morgan fired his weapon a total of 17 times, wounding several officers. According to Mr. Morgan, as a law enforcement official traveling to and from work, he is allowed to be in possession of his service revolver and maintains that he never fired his weapon and did not resist the officers. He stated that he only attempted to inform them that he was an officer, not a criminal, and it was in fact the officers who caused the escalation of events that resulted in him being shot 28 times. “They want to dismiss the fact that I [also] was an officer,” Mr. Morgan told The Final Call. “They want to charge me with attempting to kill a peace officer when I am a peace officer—and they didn’t get charged. In the 22 years that I have been in law enforcement, I have never had a problem,” said Mr. Morgan. “They are out here head-hunting. They’re nothing but a gang with guns and badges,” he added. As a testament to his exemplary law enforcement service, Mr. Morgan was elected to be the assistant union representative by his peers at Burling Northern Railroad, where he has worked for the last 13 years. The CPD is the largest police department in the Midwest and the second largest in the United States. It is increasingly being looked upon by many Chicago residents as a department that is out of control and lacking leadership. Tensions within the department are high as a result of several recent scandals that have been a source of embarrassment for the CPD and its administration, which has resulted in the upcoming “early retirement” of CPD’s Superintendent, Phil Cline. Now the Howard Morgan case threatens to expose yet another instance of undisciplined behavior from those with the highest responsibility to serve and protect the citizens of Chicago. There were numerous inconsistencies when comparing testimonies of the police officers and the recollection of events by Mr. Morgan, which caused the hung jury. Nick Olsen, one of the officers wounded on the night of the gun battle, admitted that he did not actually see Mr. Morgan fire a gun at him. Mr. Olsen had been on the police force just two years when this shooting took place, and was shot in the arm. When it was suggested by defense attorneys that perhaps Mr. Olsen had been shot by gunfire from one of his fellow officers, he vigorously denied it. Another police officer, Eric White, testified that there was a physical struggle as well, and admitted that he fired shots that hit Mr. Morgan in an attempt to subdue him. Mr. White suffered a leg wound. The only independent eyewitness to the events in question was Cherie Rush, who was visiting relatives in the area at the time of the shooting. Ms. Rush said that Mr. Morgan was kneeling down with one knee on the ground, his hands behind his back, when she heard the first shot. During the trial, a mannequin was displayed and a medical expert placed stickpins in areas demonstrating where Mr. Morgan suffered bullet wounds—including several in his back. According to observers, the testimony of the police officers lacks credulity and instead points to an accepted culture of brutality that exists within the CPD. “What did not make sense to me from what the prosecution said was that Mr. Morgan shot randomly in front of all the officers that were approaching him. So, how did he get shot in the back? It made no sense that he would have gunshots in his back. The doctor put the stickpins in the mannequin to show that Mr. Morgan could not have shot anybody being shot that many times—he couldn’t have discharged his weapon,” said Lt. Andre Bey Muhammad of Muhammad’s Mosque No. 2B on the Westside of Chicago. Members of Muhammad’s Mosque No. 2B have been thoroughly involved in the Howard Morgan case, closely following all major developments since 2005. “They had him wrestling with them, and then all of a sudden, he busted loose with some superhuman power and then began firing at them? I think they [CPD] have a culture right now of police brutality that is systematically being taught to them in their training, or perhaps their upbringing,” he added. “Howard is innocent, and we believe we will be victorious,” said Sam Adam Jr., lead defense attorney for Mr. Morgan. “The Chicago Police Department has gotten the reputation of being thugs. Remember, Howard Morgan is the victim who was shot down like a dog,” said Atty. Adam. Mr. Morgan’s wife Rosalind, who has been by his side during the entire ordeal, remained prayerful during the trial, at times, meditating, and at other times, reading the Bible. “They have power, but God has the ultimate power, and it is in God’s hands,” said Mrs. Morgan. During his May 13 address at Mosque Maryam, the Honorable Minister Louis Farrakhan directly addressed Mr. Morgan and his family who were in attendance, pointing out that no matter what the jury in the subsequent trial decides, his family and those who love him have already won. “They shot this Brother 28 times, and we are lucky; we are fortunate. We already have the victory, Brother Howard, because you are still alive,” said Minister Farrakhan.